Brownwood Paddock Square is the third and final planned town square for The Villages. The other two town squares are Lake Sumter Landing Market Square and Spanish Springs Town Square. Brownwood, which opened on October 12, 2012 is located in the Southwest corner of The Villages, west of Buena Vista Boulevard and north of County Road 44. This area is not yet as built up as other parts of The Villages, which many believe is why the developer took so long to start Brownwood which makes sense. Next door to Brownwood will be Antrim Dells, a 500,000 square foot commercial development/shopping mall. Many speculate that because of Brownwood’s location in a corner of The Villages bordering major roadways and the addition of a major shopping/commercial development, it will be more open and accessible to those living outside of The Villages. However, most residents are looking forward to the completion of Brownwood, especially since it will help alleviate some of the crowding that happens at the other town squares, especially in the months of January through April when all the snowbirds are in town. The theme of Brownwood (everything in The Villages has a theme…you’ll see) is “Old World Florida” and takes residents back to a time in the 1800’s when Florida’s cattle hunters and cowboys roamed the state.” I’m sure both Brownwood and Antrim Dells will be great additions to the amenities Villagers have at their doorstep. The Villages ownership did a great job keeping everyone up to speed on the progress of Brownwood through their video updates which you can watch below. It’s fun to learn about the thought, care, and attention that went into the planning and construction of this third and final town square. In this first video about the building of Brownwood we hear from several people responsible for designing and building The Villages third and final town square. This video features designer Tracy Mathews discussing the inspiration behind Brownwood and you’ll also get an early look at the Palace Hotel being built there. Listen to an interview with the environmental consultant in charge of the Brownwood project and learn more about all the work that happened before construction even began. Learn about the unique reclaimed wood being used on the Brownwood Paddock Square project and hear some of the “history” (folklore) behind Brownwood. This video features an interview with Dennis Graves, the artist responsible for a lot of the artwork you see throughout The Villages, and now at Brownwood Paddock Square. In this episode we get to take a look inside the Barnstorm Theater, and hear from the landscape architect in charge of the Brownwood project. This video shows even more progress on Brownwood, and shows some of the sculptures being brought in from Park City, Utah to grace Brownwood Paddock Square. In this episode you get to take a look at the inside of some of the new buildings at Brownwood. They are really coming along. The movie theater looks incredible. This episode takes a closer look at how all the landscaping is coming together as Brownwood nears completion. And check out that grand entrance. Very cool. This is actually a bonus episode, showing you the new 500,000 gallon water tower under construction at Brownwood Paddock Square. The finish line is in sight! Check out some of the almost finished buildings, and listen to a long chat with members of the Morse family. Brownwood is open, and in this video you’ll see it and hear early reaction from residents. Plus, part 2 of a chat with members of the Morse family. This is a bonus video showing the enormous bronze statues shipped in from Park City Utah, and also discusses some of the purpose of some of the landscaping surrounding these statues. 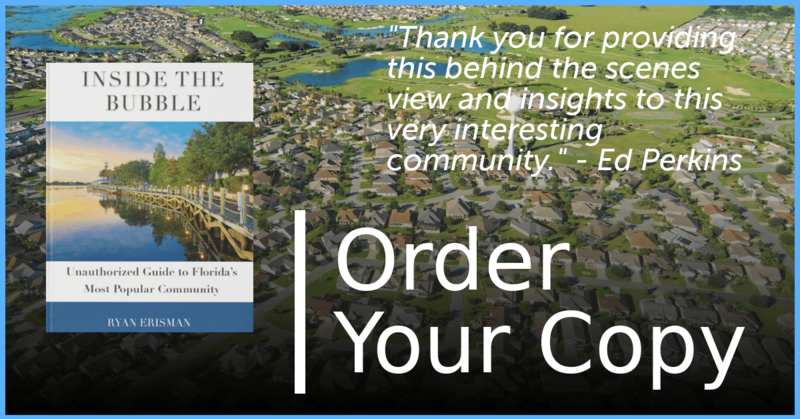 In this video we get a good look at the 11th Championship golf course to be built in The Villages, Evans Prairie, which is located near Brownwood in the south part of The Villages. In this video you’ll hear from some of the architects responsible for creating many of the notable buildings in The Villages, and you’ll see some of the buildings yet to come in Brownwood. This video covers some of the special events such as the Colonial Days event and Strawberry Festival held recently in Brownwood. In this video you’ll get a first look at the new Eisenhower Recreation Center, the first rec center South of 466A near Brownwood. Also, a new Brownwood construction update.